Cherry Picker Hire Cost per Day – Finding the right Cherry Picker for your project is very important. It’s a good idea to assess the quality and value, and at the same time you also want to know the Cherry Picker Hire Cost per Day. Hiring large equipment like this can be very important, and you really have to figure out the right options as you focus on getting the job done properly. Is the Cherry Picker Hire Cost per Day variable or not? As you can imagine, this depends on a variety of factors. 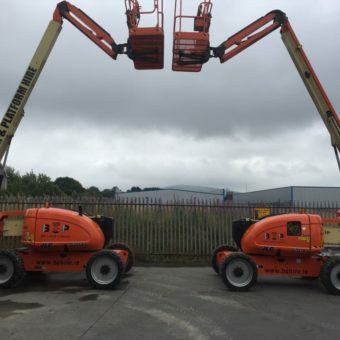 Most of the time the Cherry Picker Hire Cost per Day will differ based on what region you are in, however at Boom and Platform Hire we negate this issue with Depots in Cork and in Dublin. However, if you contact our company you will receive a quote based on your specific requirements. You know exactly how much it costs and how much you are expected to pay when the Cherry Picker is collected. The benefit is that there are no hidden costs. You know everything upfront and from the start, which does bring a solid level of reassurance. You can hire just a single Cherry Picker or you can opt for an entire crew, depending on your needs. The great thing at Boom & Platform Hire is that you get to focus on completing these tasks adequately and not concern yourself with going over budget. Regardless of the Cherry Picker Hire Cost per day you have to realise that this is one piece of equipment that’s pivotal for your project. That’s why you need to identify exactly why you need the Cherry Picker and when you actually want to hire the Cherry Picker based on your project. At Boom & Platform Hire we charge by the day and if you are local to our depot we can charge by the hour, depending on what you need. Every detail matters if you want to identify the best Cherry Picker Hire Cost per Day. But there’s no need to worry about costs that much. If you want high quality work done properly, our cherry pickers and team is always here to assist and you can rely on us to give you the customer service and high quality machines you need. We know how important it is to have a good Cherry Picker fully serviced and maintained for your project, and we can certainly provide such machines. We are always focused on professionalism and efficiency, and you can rest assured that the experience will be among some of the best. Get in touch with us and we will offer you the best Cherry Picker Hire Cost per Day that you can find on the market. We are here to help you at all times, so contact us today. We are always ready to handle any challenge or tasks that arise. Moreover, we are very professional and can easily bring in the support and help you need no matter the situation. Rest assured it will be well worth it to work with us if you need to hire a Cherry Picker! Email or call the team in Dublin or Cork on: 045 900 932 or 021 463 5600.